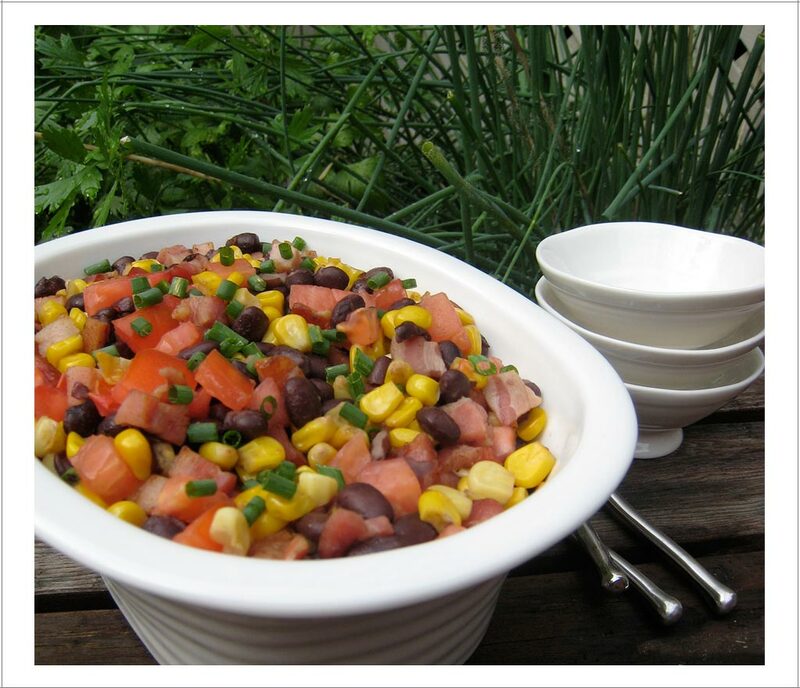 Summer’s (Not Quite) Gone – Toasted Corn, Black Bean and Tomato Salad | EmmaEats…and Katie too! The last few weeks of summer have been unusual at our house. The past week in particular has been barely-managing-to-nibble-white-toast-and-drink-chicken-soup unusual. At least one member of our family has been ill since we’ve been back from our holidays early in August. We’re usually a pretty hearty bunch but somehow, this just hasn’t been our time. Thankfully, we seem to be on the upswing now. September marks many things: a new season, back-to-school, new (or reestablished) routines — and for us, it’s back-to-health. We celebrated this back-to-health by spending our last long weekend of this summer together as a family: enjoying the lazy mornings, the golden bright warm days, the unhurried meals and the many unplanned moments that presented themselves. Together. One of these slow meals consisted of a slow-roasted pork shoulder, a fresh peach pie, s’mores and this salad. Nothing rushed here – the pork went on to the smoker early in the morning, the buttery pastry was made, fresh sweet peaches were sliced and pie was baked and cooling shortly after noon and the salad resting, flavours mingling, shortly thereafter. By the time dinner rolled around, we spent a few hours frolicking in the grass outdoors enjoying the end of the summer. The best part of this salad is that it uses lots of fresh seasonal produce – crisp sweet corn, juicy ripe tomatoes, fresh cucumbers and zesty chives. It’s easy, it’s fast and it’s flavourful – particularly once it has a chance to sit and let the flavours develop. Summer’s almost gone but there’s no reason to rush it — instead savour of every last minute of it. In a large frying pan, brown the pancetta on medium heat until lightly golden. Add the corn kernels and cook on medium-high until lightly golden. Add the corn and cook until the corn is slightly toasted and cooked through. Remove from heat. Stir in beans and tomatoes. Season with chives, olive oil and chipotle sauce. Serve warm or room temperature. This salad tastes better after it sits for a few hours or overnight. If you can manage to make it in advance, do so. It’s worth it! You’ll notice there is no additional salt in the recipe. The pancetta already has enough salt for our tastes. Try grilling the corn on the cob before adding it to the salad. You won’t have to toast it in the pan if you prefer to skip that step. Delicious! What a great idea. I have to wonder how many tortilla chips Katie would eat with the enormous amount of the salad she eats! Thanks for visiting and for the yummy suggestion! This looks delicious. Even thought the weather has turned cold (and rainy! ), I feel I can still squeeze out a couple of summer salads before the end of September. I love the grilling the corn on the cob idea first. I’m going to try this for a group this weekend. Thanks! Thanks — I’m hoping that the cold/rain is just a temporary setback this week and that we’ll still see lots of sunny days (and a few warm ones too!) before the end of the month. Good luck this weekend — I hope you all love it, especially with the grilled corn!